The 44th Annual Baeksang Arts Awards was held this evening at the Seoul National Theater and it was a star-studded event. There was some shock winners among the usual suspects. Stars At 44th Baeksang Art Awards. This entry was posted in Kang Ho Dong, Kang Ji Hwan, Kim Jung Eun, Kwon Sang Woo, Lee Ji Ah, Park Myung Soo, Park Yong Ha, Stars, Sung Yuri, Tae Wang Sa Shin Gi, Yoon Eun Hye. Bookmark the permalink. KANG JI HWANNN!!!!!!!!!!!! YAY!!!!!!!! I’m so happy for him, he totally deserves it!!!!!!! I actually saw Han Ye Seul in Miss Gold Digger just some days ago, and I was positively surprised by her acting, as well as the story which seems a little more daring, or should I say unconventional, than the usual comedies from Korea. Good Yun Eun-hye won that price. yay , yoon eun hye got the best leading actress. Good for her. She deserves it. hmm.. how come han ye seul receive an award for Best new actress? – I mean.. she is not new in the acting business.. ? and i am so happy for Kang Ji Hwan and Sung Yuri for their popularity award, they deserved!! You’re really quick for this event. The pictures are in excellent quality. Thanks so much. of all winner, i think park shin yang truly deserve his award! kang ho dong looks really happy ^^, congrats to him too! congratz to all the winners..
kang ho dong seem so happy that he won..lol..
i think han yeseul got new artist because it’s movie category. it’s her first movie right? wow, Sung Yuri looks really pretty in the last picture. aww. congrats to yun eun hye! she definitely deserved the award. and i love shin bong sun in happy together! she’s so hilarious! especially when dbsk was on just recently. awww…Park Min Young didn’t win best new actress. congratz to all the winners~!! ehehe. XD. I am sooo glad they all won! Specially Yoon Eun Hye (i love her style) and Kang Ho Dong (he is so freaking funny!). hello Miss Leslie Kim!!! just wanna say i love you!!!! wow…yoou eun hye you deserved that award…we are all happy for you…. Wow!!!!!! 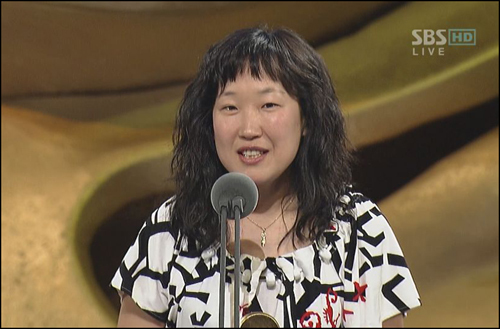 Congrats to lee jiah…. the philippines. You have many fans here. Good Luck on your carrer. The first time we saw Ms. Lee Ji-Ah on screen, we are amazed of her charm and beauty. She looks like a goddess of beauty and we believe that she is a promising actress and brave, Ms. Lee Ji-Ah touches the very core of our heart… The way she looks and the character she impose in the said program is awesome. A pretty warrior with a good heart and aim to see the world at peace. Me and my friends love the character she had… A lady with beauty and have a big heart in love with the king, who never loses hope still love truly and always seek the good of others and ofcourse the one she love… Fantastic!! She made a great performance and no doubt about it. We are glad to know that she won Awards and even got the Best Couple Award with Bae Yong Joon… they really look good together, We hope to know them dating in real life, We love to see Ms. Lee Ji-Ah and Bae Yong Joon in the future and if given the chance to go abroad , we will go to Korea First and be looking forward to see them. It will be an honor and privilege to know them personally but in the mean time we will always be here to support them and will always give the biggest appreciation from the bottom of our heart. More Powers and blessings to Ms. Lee Ji-Ah and Bae Yong Joon we love the two of you!! take care… We Filipinos love you!! He`s a Great Actor!! No wonder he won!! i just hope that there’ll be coffee prince pt II wit the same GY n YEH cos i luv them n they really click. How i wish 2 of them r couple in real life(cross my finger) hehe .. or they make another movie together again….. plz plz…. i’m the real fans of yoon eun hye n i cant wait to see her next movie if true that she will be doing FULL HOUSE , i hope that she got the role n of course the leading actor will be GONG YOO (hoo how i wish 2 of them together again)…. when i saw coffee prince i really fall in luv wit the movie n i even watch this movie many many times n i dont feel bored cos YEH n GY are really compatibles with each other…..
Tae Wang Si Shin Gi rocks~! Lee Ji Ah did really well~! I’m really happy for JANG GEUN SUK. I like him because he is the best actor of korea. THE BEST NEW ACTOR. He has the best sound ,he play well and he is so handsome . I hope that he got the best of best role in his life. JANG GEUN SUK shi FIGHTING.